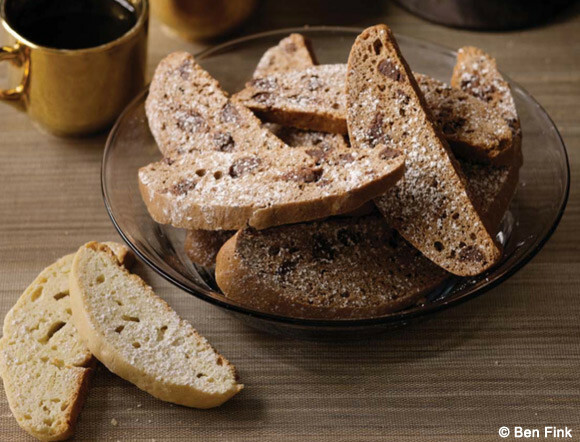 With no oil or butter, traditional Italian biscotti are much healthier than those candy-covered sticks you get in Starbucks. Here are my favorite 3 versions. Italian biscotti aren’t the same as the thick, gooey, chewy, caramel- and candy bar–filled cookies we love so much in America. Since Italian biscotti don’t have oil or butter in them like many American versions, they are much healthier and, be warned, much harder. The magic comes when you dunk your biscotti into your coffee and it comes back to life, all soft and chewy and full of flavor. Biscotti means “twice cooked” in Italian. Biscotti dough is baked once, cut into long strips, and baked again, so it’s crispy and almost dry. Here’s the basis for a “plain” biscotti, with easy cinnamon, almond, and chocolate variations. 1. Position a rack in the center of the oven and preheat the oven to 350°F. Line a large baking sheet with parchment paper. 2. Whip the eggs, granulated sugar, vanilla, and almond extract in a large bowl with an electric mixer on high speed until thick and pale yellow, about 3 minutes. In another bowl, stir the flour, baking powder, and salt together. Stir into the egg mixture to make a stiff, sticky dough. Stir in the almonds. 3. Sprinkle the confectioners’ sugar over the work surface. Transfer the dough to the work surface, and knead gently until the dough is cohesive and loses its stickiness. Shape into a thick 8-inch log and transfer to the baking sheet. Shape the dough on the sheet into a log about 12 inches long and 2 inches wide. 4. Bake until the dough is lightly browned and cracked, and feels set when pressed on the top, about 30 minutes. Let cool on the baking sheet for 30 minutes. 5. Reduce the oven temperature to 325°F. Carefully transfer the log to a chopping board. Using a serrated knife, cut the log on a diagonal into 1/2-inch-thick slices. Arrange the slices, flat sides down, on the baking sheet. (You may need 2 baking sheets. If so, place a second oven rack in the top third of the oven.) Bake until the surfaces begin to brown, about 10 minutes. Flip the biscotti over, and bake for another 10 minutes. The biscotti will become crisper when cooled. Transfer to a wire cooling rack and cool completely. Substitute 3/4 cup toasted, peeled, and coarsely chopped hazelnuts for the almonds. Omit the almond extract and add 1 teaspoon ground cinnamon to the dough. Add the grated zest of 1 orange and 2 tablespoons fresh orange juice to the dough. Reduce the flour to 2 1/2 cups. Add 1/4 cup unsweetened cocoa powder to the flour mixture. Stir 1 cup (6 ounces) semisweet chocolate chips into the dough. I made these last night and brought them into work today so I would not eat them all myslef. I made half without the walnuts, in case someone did not want nuts, but the salted and toasted walnuts really added an important element that made these biscotti more-than delicious. This will be my new go-to biscotti recipe, and I look forward to trying variations on the recipe. I did have to increase the oven temperature for the final baking, after I had cut the biscotti pieces, but only by about 25 degrees. I also live in a very humid environment, so it is sometimes harder to get things crispy, than it might be elsewhere.